The Surma people is made up of three ethnic groups: The Mursi, the Suri, and the Mekan people. The Suri and the Mursi share a similar culture. 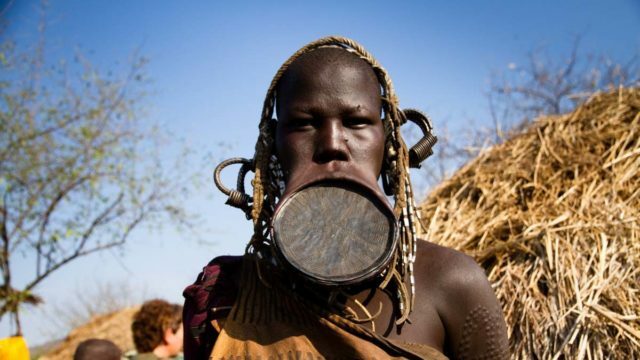 Their women’s beauty is determined by how large their lip plate is. Lip plates are usually made of clay or wood and range between 4 and 25 centimeters. To be placed on the lip, two or four teeth are removed before the lower lip is cut to fit the lip plate. This lip plate process is usually done by their mother when they attain puberty to stretch the lip, a ceramic disc is placed after the cut and will remain until the initial cut has healed before it is placed with another slightly larger disc . The process is repeated so that the lip will become large enough to accommodate the first lip plate which is about 4 centimeters. Apart from designing their skin with incisions and patterns which are sometimes painted, the lip plate is seen as a boost of one ’ s self -esteem. The lip plate tradition is valued by both parents because it indirectly means that the father ’ s number of cows will increase when he is paid her dowry . Any man who must marry a Suri or Mursi lady has to be wealthy because her dowry usually falls between 40 cattle ( for the small plate) and 60 ( for the large plate) .